Thirty years ago, on June 17, 1984, Jean-Marie Le Pen burst into the limelight when his party, the radical-right National Front, scored a record 11 percent in the European Parliament election on an anti-immigration, anti-Europe nationalist platform. France was stunned. On election night, the 55-year-old Le Pen, smug and sententious in a dark-blue blazer, predicted, “This is only a beginning,” calling the victory “the first stage in a long journey that will lead to France’s rebirth.” But even in his wildest dreams, Le Pen could not possibly have pictured his own daughter Marine, now the head of the National Front, riding the crest of one of the worst social, economic and cultural crises in France to lead the polls ahead of every other contender. A January 25 survey credited the National Front with 23 percent of the vote in the May European Parliament elections, ahead of the Socialist Party and the right-wing Union for a Popular Movement (UMP). If the prediction comes true, hers would become the leading political force in France. How did a fringe party born in 1972 of an eclectic coalition of former collaborationists, neofascists, anti-Zionists and opponents of decolonization become, if not mainstream, at least increasingly attractive? 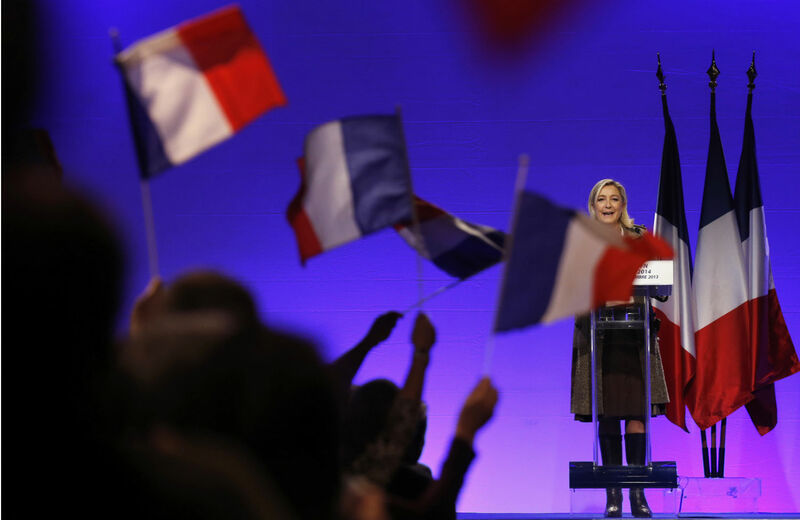 Did the National Front tone down to adapt to France’s political ecology, or did France veer dangerously to the right? And how much higher can the National Front rise? With nationwide municipal elections coming in March and the European Parliament elections two months later, 2014 will be a crucial year for the National Front—and for France, which is summoned to resist, or heed, the siren song of far-right populism. Marine Le Pen is often described as the driving force behind this staggering ascent. There is no doubt that the perky 45-year-old blonde has managed to put a modern gloss on an old political brand. When she took over the party in 2011, Le Pen’s last name was a liability as much as an asset: voting National Front was taboo, and few were open about doing it. Now “Marine,” as everyone calls her, is a rising star. Journalists rush to be the first to report her latest zinger. Bystanders jostle to get their picture taken with her in the open markets. She cracks a joke, kisses the grandmas on the cheek or bursts into her extensive repertoire of French pop songs from the 1970s. Forthright and good-humored, the down-to-earth mother of three comes across as a brave, outspoken mom ready to take hits in the wild west of politics. “She has glorious balls,” volunteered Gilbert Collard, formerly a left-wing immigrant rights advocate who succumbed to Marine’s charm and is now a congressman affiliated with the National Front. Like Collard, many voters who fall for Marine would never have voted for Jean-Marie. The comparison with her father serves her well (it’s easy to look angelic next to the “devil,” as he has been called); so does the generational gap between the two. That a woman born in 1968 is at the head of the formerly macho, rearview-mirror-looking far-right party is in itself a revolution of sorts. A twice-divorced single working mother, Marine “looks” feminist without having much to show for it. Having inherited a party that called abortion “anti-French genocide” and compared it to the crematoria at Auschwitz, she has only to be mildly moderate on the issue—proposing to stop reimbursing pregnancy terminations—to sound liberal. Le Pen (Marine’s niece), was elected at 22. Now the National Front is going one step further, hijacking and exploiting the very concepts it used to oppose. Le Pen invokes “liberty,” “democracy,” “justice” and “secularism” to back her claims that “the system” is betraying France’s republican principles. Never mind that the National Front is the political heir of anti-republican, anti-Enlightenment, even royalist radical-right movements such as Action Française (the National Front’s candidate for the fourth arrondissement of Paris is a member of the royalist league). The “new” National Front is eager to show respect for the letter, if not the spirit, of democratic principles. And so Le Pen has recast herself as the only leader eager to defend the people’s rights, especially the right to self-determination. When she accuses nonelected supranational institutions such as the International Monetary Fund or the European Union of pulling the strings of France’s government, she echoes a rising suspicion among her constituents that their voice and their vote count for naught. She also points out that despite having won 18 percent of the vote in the 2012 presidential election, the National Front still has only one congresswoman to represent its ideas in Parliament, a violation of fair democratic representation in her view. In fact, her stirring speeches on freedom and equality target selective “abuses”: “anti-white racism,” for instance, or censorship of hate speech. In the name of freedom of expression, she condemned in January the pre-emptive ban of the controversial standup comic Dieudonné’s latest show by several municipalities (the comedian, a friend of the elder Le Pen, has repeatedly questioned the veracity of the Holocaust in his skits); when her parliamentary immunity as a European MP was lifted in July 2013 to investigate charges of inciting racial hatred, she talked of “persecution” (she had compared Muslim street prayers to the Nazi occupation). Marine’s name might be just a few letters shy of that of Marianne, the symbol of the French Republic, but masquerading as a democrat does not make her one. Social and economic policies have also been repackaged with a modern, populist flair. Stopping immigration is no longer the main article of faith in the National Front’s platform (for the 2012 presidential bid, it had dropped to number seven). Instead, Marine Le Pen euphemizes the race card and appeals to class dynamics. Railing against “Eurosterity”—austerity measures imposed by the German-dominated Eurozone—she pushes a crowd-pleasing agenda of protectionist policies, re-industrialization and a strengthened welfare state (for French citizens only). Here again, she sounds more left than right: she scourges big money, promises to nationalize commercial banks and separate them from investment institutions, advocates for extended public services and pledges to lower the standard retirement age back to 60. In her 2012 presidential campaign book, she quoted Karl Marx more often than nationalist theoretician Charles Maurras. If Le Pen is a shrewd tactician, she has also benefited from a broader drift toward the right of the entire political spectrum. The right-wing UMP has been hunting on National Front territory for a while: the Sarkozy administration made immigrant-bashing a habit and launched insidious “debates” on national identity and Islam in 2009 and 2011. Now the Socialist government is playing tough on illegal immigration and Roma encampments for fear of appearing “soft.” On the economic front, the Socialists’ new infatuation with pro-business, supply-side economics has left its core constituents flabbergasted. According to Bouvet, “The left, like the right, is responsible for the ascent of the National Front in the polls and at the ballot box. The essential, structuring factor of the last thirty years is that the left has abandoned the lower class in terms of social and societal policies.” Add to this deadly mix the inability of either side to turn around a stagnant economy, and one starts to understand why Le Pen appears to many as the last political resort in a country gasping for its economic and cultural survival. ord 11 percent level and news of massive layoffs monopolizing the headlines, Marine Le Pen echoes the legitimate concerns of those who fear that France’s model of social redistribution is threatened by fierce international competition and stringent European rules. She also gives them a narrative to frame their experience of identity loss and downward social mobility. “It’s now nation versus globalization,” she told me. “Do we go on with mondialisme—the erasure of borders, complete economic deregulation, financial powers ruling the world—or do we consider that nations should have a say in it, and so we give them their rights back?” Her discourse of regained national sovereignty hits home: in a January survey issued by the Institute of Political Science’s Center for Political Research (Cevipof), 61 percent believed that globalization was a threat to France; 70 percent wanted to give greater power to national governments and less to the EU. A majority of workers stated, like Le Pen, that France should exit the euro—an unthinkable statistic only a few years ago. For the first time since the so-called Identity, Tradition, Sovereignty group in the European Parliament imploded in 2007, after only a few months of existence, anti-European far-right parties may be able to coalesce into an official parliamentary group in Strasbourg, with all the political leverage that implies. In November 2013, leaders of the Netherlands’ PVV, Belgium’s Vlaams Belang (Flemish Interest), Italy’s Northern League, Sweden’s Democrats and Austria’s Freedom Party convened with Marine Le Pen in Vienna to form the European Alliance for Freedom. Jean-Yves Camus is careful to qualify how dangerous or even effective such a coalition could be: “Putting nationalist parties from all around Europe in the same room has always ended in fiery fights between people who have many reasons to disagree on religious or ethnic issues, or on unsolved border disputes or on conflicting national memories.” Other analysts remark that such a coalition would gather, at best, 4 to 6.5 percent of the seats in the European Parliament—not enough to do real harm. The municipal elections may also not be the tidal wave Le Pen has hoped for. For lack of credible candidates, the National Front is now expected to run in only 500 of the 36,000 towns and cities where elections will be taking place in March. In recent months, defectors have come out in the press and described nauseating racist comments heard in members-only meetings. As a result, Le Pen’s popularity may well have plateaued. But the real measure of her success may be less in the polls than in people’s minds. On immigration and Islam, she has already won: according to the same Cevipof survey, 66 percent think there are too many “foreigners” in France (up from 49 percent in 2009), and 63 percent believe that Islam is not compatible with French society’s values. The topic has become such a land mine that challenging these views is political suicide: left or right, few have the courage to contest with hard facts the National Front’s narrative of immigrants stealing jobs and benefits, even though studies show that immigration as a whole brings in a net benefit of somewhere between 4 billion and 12 billion euros to the state’s annual budget. On other issues, too, public opinion is proving fertile ground for the National Front’s electoral efforts. Distrust in political institutions is rampant: only 8 percent trust political parties, 23 percent the media, 23 percent the Parliament. Like Le Pen, 85 percent think France is in decline. And with 78 percent of the people polled responding that democracy is not working well in France, democratic disenchantment is at its peak. In fact, the mood in France has become quite toxic. Last fall, Minister of Justice Christiane Taubira, who is black, was compared to a monkey in demonstrations against gay marriage; on the cover of Minute, a far-right weekly; and on the Facebook page of a National Front candidate. Then came the Dieudonné scandal, and France discovered that anti-Semitic YouTube posts attract hundreds of thousands of viewers. On January 26, a Tea Party–flavored hodgepodge of anti-tax protesters, pro-life zealots, gay-bashers and Dieudonné fans marched in Paris in disturbing numbers, turning out by the thousands to chant slogans like “Jews out, France is not yours!” Which raises, again, the important question: Who has changed the most in recent years, the National Front or the French? I asked Le Pen if she thought she had won on the ideological front. “Oh yes. We have achieved a great number of ideological victories,” she promptly replied. “The problem is, that’s not enough. We have to transform them into political victories.” With two rounds of elections in the coming months and a pernicious political climate, she might be able to do just that. Cécile AlduyCécile Alduy is Professor of French Studies at Stanford University and a research fellow at the CEVIPOF in Paris.